With just a few games left in the 2018-2019 NBA season, the Lakers are almost out of this hellish season. To say this season was disappointing for the Lakers is an understatement. Most fans had reasonable expectations for how this season would go, but some didn’t. Personally, for me, the top four seeds were never in play for the Lakers. I was happy the Lakers could potentially end up in the playoff picture. But midseason injuries to Lonzo Ball, Lebron James and Rajon Rondo cost the Lakers dearly. While the Lakers receive some sympathy for the tough run of injuries, what they don’t deserve is a pass for the poor management of the team. Magic Johnson is an icon in Los Angeles. Magic represents Los Angeles in a way few others in the city’s illustrious sports history can. That being said, what he was doing with this Lakers team is unclear, to say the least. In 2017 Magic selected Lonzo Ball with the second overall pick in the draft. Don’t get me wrong, Lonzo could still pan out and I hope he does. I think he needs more time until we really know who he is. That being said, Magic decided to draft a traditional point guard in a league where shooting rules. This isn’t the NBA of Magic’s day. Drafting a guy who struggled with his jump shot isn’t exactly a formula for success in the modern NBA. Sure, Magic drafted Kyle Kuzma, props to him, but not many thought Kuzma would turn into what he has. Keep in mind 26 other teams passed on Kuzma. The following year in 2018, it seems like Magic finally understood what the NBA was moving towards. Moritz Wagner was a center that can stretch the floor with his ability to shoot the ball. Svi Mykhailiuk was a pure shooter coming from Kansas where he shot 44 percent from three-point range in his senior year. Although Lebron James arrived nearly a month later, the Lakers seemed to be putting things into place for a successful season. Although nothing was set in stone, most in NBA circles knew that Lebron was on his way to Los Angeles. Historically, Lebron has been most successful with a number two option and shooters all around him. On the Miami Heat, he had the third-best shooting guard of all time and Chris Bosh, one of the leagues earliest stretch four type players. Those three combined with the shooting prowess of Ray Allen, Mike Miller and even Mario Chalmers and Norris Cole from time to time, and guided the Heat to an NBA championship. In Cleveland, the Cavaliers featured a budding star in Kyrie Irving and shooters like Kyle Korver, Iman Shumpert, and JR Smith. The common theme throughout? Shooting. The Lakers were moving towards that, or so it seemed. The free agents brought in by the Lakers made little to no sense. JaVale McGee, Lance Stephenson, and Michael Beasley don’t provide much. Rajon Rondo was odd in a Lakers uniform. He did bring leadership and a winning pedigree, but then again, Rondo has never had the ability to shoot the basketball. His strengths have always been passing and creating opportunities for his teammates, but he has only shot 31 percent from the three-point territory in his career. The Lakers were poised to enter the season with one of the worst shooting lineups in the NBA. Brandon Ingram has never been a “shooter”. What was the game plan? Trust Magic sure, but what was the goal? Can’t beat them at their own game? Rob Pelinka had an interesting quote to start the season. I guess I understand the logic, with one of the greatest shooters of all time, the second best player in the game and Klay Thompson, a great shooter in his own right, you can’t simply out shoot them, but who was this “tough two way player that can shoot”? What player on the Lakers roster was that guy? Kentavious Caldwell Pope? It clearly wasn’t working out in Los Angeles. Something had to be done. The next logical step? Trade the player with the second most potential of all the young core on the Lakers. Yep, up until that point in the season, Ivica Zubac had shown the most promise of any young Laker not named Kyle Kuzma. A big man with a knack for offensive rebounds, defense and shooting nearly 80 percent from the free throw line was traded for an older version of Mo Wagner in Mike Muscala. Then, the Lakers trade their best statistical shooter (who barely saw the floor) Svi Mkhailiuk, for Reggie Bullock, a 27 year old journeyman who was supposed to bring more shooting to the team. Again, what was the thinking? Here we are, the end of a miserable season for Lakers fans and players alike. Unfortunately, someone has to take the fall for this nightmarish season. It’s disappointing that Walton has to be fired, but I think the Lakers will fire him the moment the season ends. In my opinion, Luke was the perfect coach for the young players on this team. Make no mistake, he won’t be jobless for long. The question that bothers me is this: At what point will the Lakers hold management responsible? 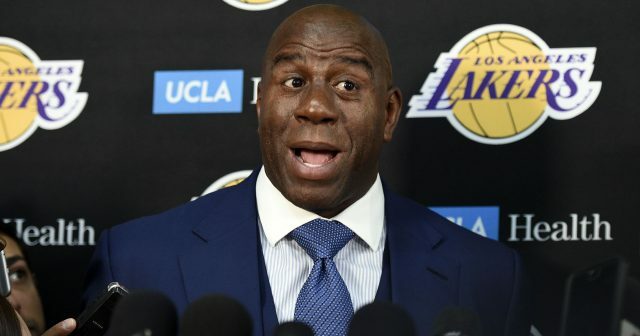 Magic Johnson means plenty to this community and the Lakers’ storied franchise, but at a certain point, he must be held accountable for his decision. That won’t be this off season, but the Lakers hesitancy to hold him responsible, based purely on nostalgia, could haunt them for years to come.